The new Idaho Quarter design was released this week. For those of you who might live outside of the US, we in the US enstated a program a few years ago where we would have a design from each state of the union for our quarter dollar coin. Each year, 5-7 new state designs are minted by our treasury. The states involved started in the east and have slowly moved west. 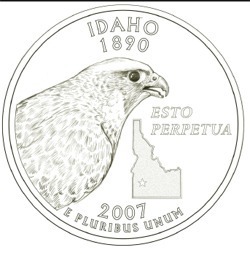 In 1997 the quarter dollar coin representing Idaho will be minted. This week the design of the 1997 Idaho coin was introduced. As you can see from the picture, the Peregrine Falcon was chosen for the face of the coin. This is in recognition of the Peregrine Fund, founded in Boise Idaho, and its role in bringing the Peregrine Falcon back from the brink of extinction. It is also in recognition of the Peregrine Falcon being the official state raptor. As a bird enthusiast, I think this is an excellent choice. The choice has been less popular with the population at large. Some online polls have indicated up to 70% of respondents being against the design. The top complaint is that the design should include more of a wilderness theme. I must say, as a native Idahoan, I'm very disappointed. While saving the Peregrine Falcon from extinction is honorable, it doesn't even come close to capturing the essence of what Idaho is. Of course that's hard to do on one quarter, but this just doesn't cut it. Thanks for posting it. I hadn't heard the news.